If you said this bird was a small gull you're on the right track. Several small gulls have pale gray upperparts like our candidate, including Bonaparte's, Black-headed, Ross's, and Little. Bonaparte's and Black-headed have a sharply defined dark trailing edge to the primaries which our bird lacks. A Ross's Gull would lack the dark cap of our quiz bird and would have gray tips to the outer primaries. The dark cap is typical of basic plumaged Little Gulls, and the white tips to the outer primaries are diagnostic for all adult Little Gulls, vis-á-vis adult Ross's Gull. 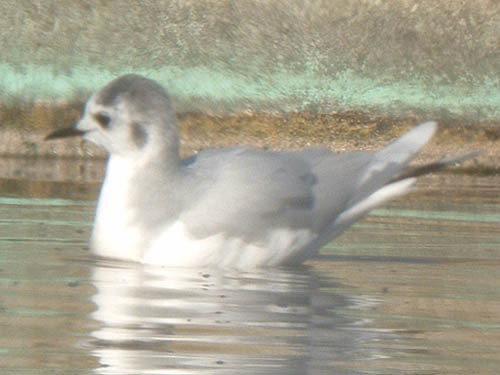 This basic plumaged adult Little Gull was photographed on November 14, 2004 in Kenosha County, Wisconsin.